Sticky buns. They bring to mind the people who have stuck by me in my life. My husband and my two children are the people who love me, care for me and will always be by my side. I am an incredibly lucky individual to be surrounded by such beautiful souls and unconditional, constant love. Always count on, and express gratitude towards, the people who have loved and supported you. Do not trouble your thoughts with those who have not. It’s the special, kind people who make your life beautiful – and allow you to wake up to each day with a big smile and warm heart. My mother passed away yesterday. I did not know her well, but I feel a profound sense of loss and sadness. I find myself baking early in the morning and often. There is something incredibly comforting about being one with the kitchen. I can’t really explain why, but everything makes more sense when I am whisking. Of course, the smells of a a hot oven, filled with rising goodies, are equally reassuring and heart warming. My mother was a brilliant and vibrant woman. Her life ended far too early and sadly. She died of esophageal cancer at the age of 64. Though she is gone, she made her genetic imprint on the world. She passed on her DNA to me, her daughter, and my children, her two grandchildren. Her passing reminds me of how fortunate I am to have my small but mighty family, who stick by me, and who I love more with each passing day. It also reinforces how short and precious life is. I hope to do more with my life tomorrow than I did today. I aspire to treasure the gorgeous gift life is: both my own life and the lives of my treasured family. The sticky buns are a crowd pleaser. 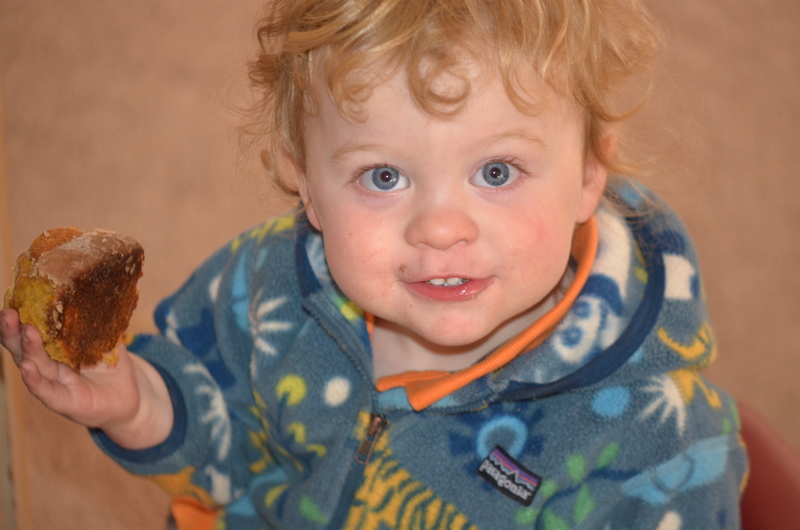 Everyone in our little family enjoyed them, especially Littlest Guy and Snu Magoo! 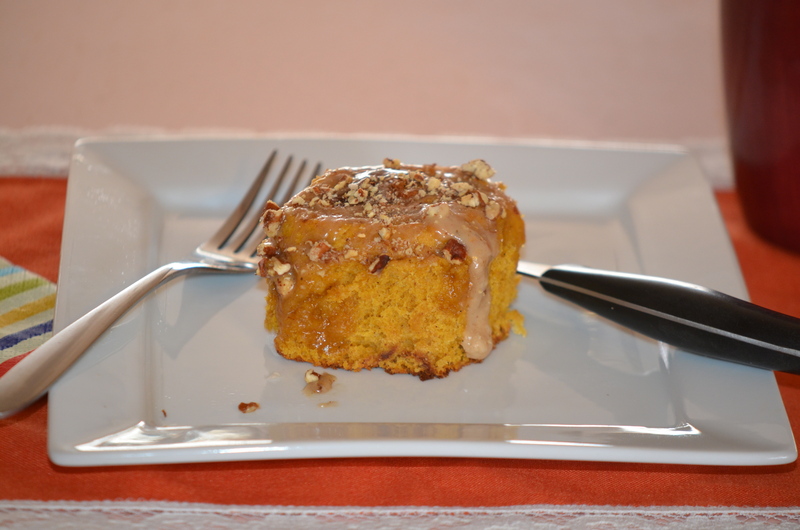 These Light Sweet Potato Streusel Buns are whole grain, reduced sugar and low in fat. There is no sacrifice in flavor, texture or taste. They will win your heart (and your stomach). The buns are incredibly moist and perfectly “sticky.” The spices in the streusel are warm and comforting, reminding me of the smell of a winter morning. Some buns are overly buttery or sweet, but these are just right (this description brings to mind the porridge in Goldilocks and the Three Little Bears: “Just Right!”). When I reheat the gooey treat the next day in the oven, I like to add a pat of butter or Earth Balance and a drizzle of pure maple syrup. It takes the warm pastry to new heights. This week, I received a gift of goat butter from a dear friend. It was the perfect addition to a “morning after” bun. The buns are easy to make, though they do require a bit of love and tender care. Make them the night before breakfast and bake-off in the morning. Simply allow the pan to come to room temperature while the oven preheats. Or, start the process on a lazy weekend morning, and they will be ready in time for brunch. Dissolve the yeast in warm water in a large bowl. Allow to stand for five minutes. Spoon flour into dry measuring cups and level with knife. Add two cups flour, pumpkin and all the ingredients through the cinnamon to the bowl. Beat with a mixer on medium-speed until the batter is smooth. Turn the batter out onto a floured surface. While kneading, add the remaining 3/4 cup of flour, a tablespoon at a time, until the batter becomes a “tacky” dough, does not stick to hands and you can form a ball. You may need to use slightly more or less than 3/4 a cup flour. This kneading process should last for about ten minutes. Put the dough in a large bowl sprayed with cooking spray. Turn dough to coat. Cover and allow to rise in a very warm place until double in size, about an hour. Punch the dough down. Cover again and allow to rise for thirty minutes more. Mix the 3 tablespoons granulated sugar, brown sugar, 2 tablespoons flour, and cinnamon in a small bowl. Cut in the butter with two knives until the mix is a very coarse meal. Punch the dough down. Then, cover and let rest for 5 minutes. Next, roll the dough into a rectangle on a floured surface, about 12×10 inches. Sprinkle the dough evenly with the brown sugar mixture. Then, roll up the rectangle tightly, starting with a longest edge. Press firmly to get rid of any air pockets. Pinch the seam and ends of the dough to seal well. Cut roll into twelves slices, approximately one inch each. Place the slices in a 9-inch, circular cake coated well with cooking spray. Cover and let the buns rise 30 minutes or until they doubled in size. Bake the rolls at 375°F for 20-25 minutes, until they are a light gold hue and firm when tapped. Place the pan on a wire rack. Cool for ten to fifteen minutes in the pan. Meanwhile, prepare the glaze, combine the powdered sugar, 1 tablespoon hot water (or more, if needed), and vanilla extract in a small bowl. Stir vigorously with a whisk until silky smooth. Drizzle glaze evenly over buns and serve them nice and warm. Whisk in the maple syrup and and 1/8th to 1/4th teaspoon cinnamon, to taste. Drizzle glaze evenly over buns, sprinkle with pecans, and serve nice and warm. *You can prepare the buns the night before and bake them the next morning. Just allow your cake pan to come to room temperature while the oven heats up. 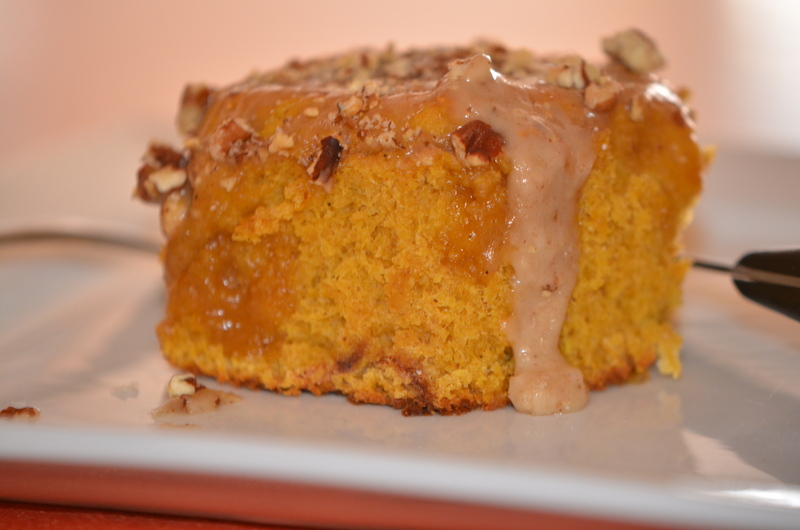 Posted in Healthy + Sweet Treats, lactose-free, RecipesTagged darn good, lactose-free, Light, Low-Fat, sticky buns, sweet potato, Whole GrainBookmark the permalink. I know what you mean about the therapeutic value of baking and cooking for family and friends. And as for this recipe, thanks for giving me a good reason to make sticky buns – they sound more nutritious and tastier than the usual overly sweetened one. Dear Shanna, I am so sorry for your loss. It is an amazing comfort that you have your husband and your kids (and the one on the way) when you think of the cycle of life. I’m also sorry that you didn’t know your mom that well. Life is so strange. These sticky buns look amazing and so a propos because they stick, like love, like lasting memories and they are sweet. Wishing you strength and love. Please feel free to email me. Un beso. PS your kids are adorable. So sorry to hear of your loss. Such a touching post and good reminder to appreciate our loved ones. 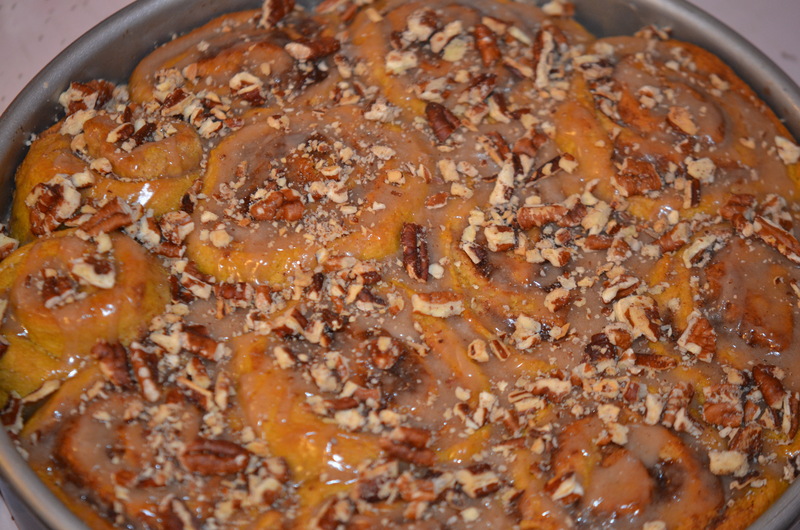 The sticky buns look wonderful…hope to try them soon. My dearest Shanna, so sad to hear about your mother… It’s family like the one you’re surrounded by what provides us with the strength to carry on. Those buns are the perfect treat for moments like these, I’m sure, and for any moment one needs the reassurance of nice and comfortable things around. Great recipe; I adore yeast buns and these meet all the necessary ingredients to become a winner from beginning to end! My thoughts are with you Shanna at this sad time. It is so nice to have a loving family around to support you through what will be a long, difficult time. Stay as strong as needs be but, don’t be afraid to let go. So sorry to hear about your mother Shanna. It is good to know you have your little ones and dear hubby. I know my family helps me get through everything too. And as for baking, it is so therapeutic. It is nice to find joy in baking and know at the same time that your are providing your family with a nutritious morning treat. You put the future and the past in your post, Shanna. I can see your family through the smile of your kids, the memories of your mother and this nice recipe. My sincerest condolences on the loss of your mother. I think when we lose a parent it stirs something inside of us (especially if we ourselves are parents) where we begin to reflect on how we were raised and what we hope to pass onto our children. I did a lot of thinking when my Dad passed away a few years ago. what a set of photos! 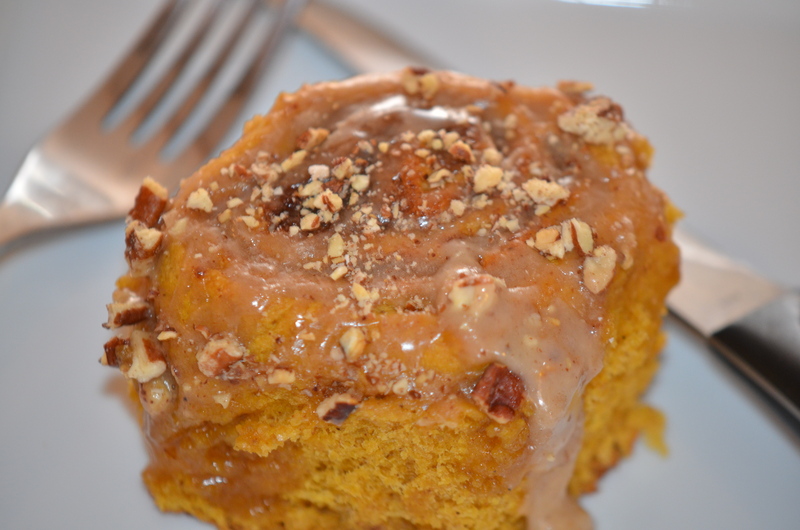 You worked especially hard on this one 🙂 Those rolls look delish and I totally get that the sweet potato flavors would be just right for sticky buns. This is brilliant–healthy and delish. And of your mother’s passing:My heart goes out to you, but I am also amazed at your bravery and willingness to look past hurts, etc. You are an incredible woman, Shanna, and a fine example to those lucky enough to know you so closely. Blessings to Snu, Littlest, Abba , and you. Shanna…you and your family have my deepest sympathy. I’m so sorry for your loss… and am so happy to know that you have your loving husband and beautiful children to support you through such a sad and difficult time. 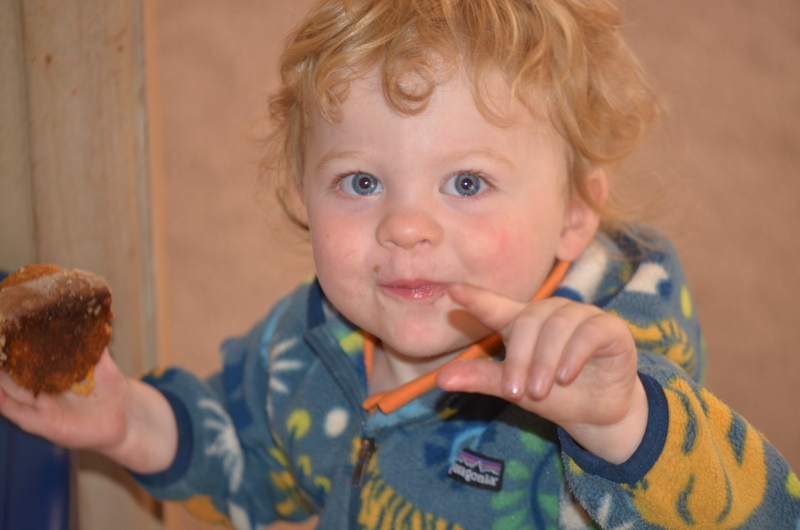 Your children are absolutely beautiful, and to be honest, I found myself scrolling through the photos enthralled with those big gorgeous blue eyes and beautiful faces before I realized that I was passing by your words. I had to go back and read, and was sorry to read such sad words. The sticky buns are the perfect thing… so good for the soul. Take care…I’m thinking of you..
this is beautifully written – so sorry to hear of your loss. the recipe, though, will always serve as a wonderful reminder 🙂 blessings. Your tributes to your mother and to your family were profound and special. You all are in my thoughts at this difficult time for you. 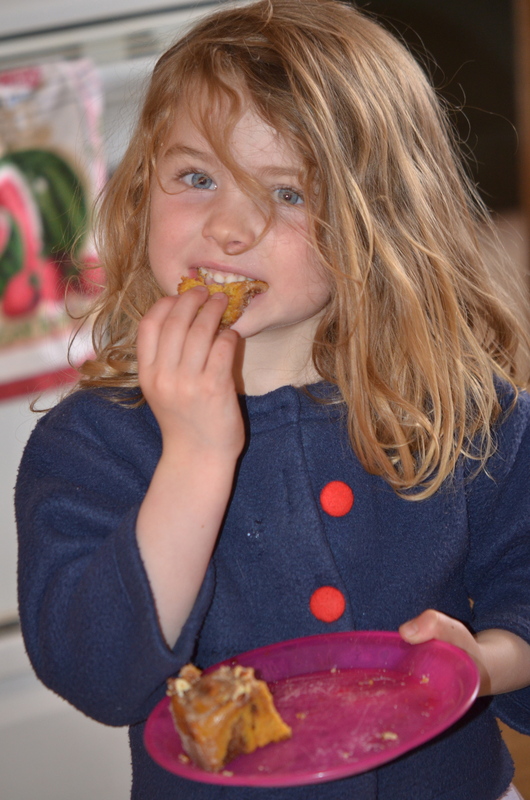 Beautiful photos ~ such a great thing to see such wonderful kids enjoying their mom’s cooking. From experience I know that nothing is better! Shanna, I am so sorry for your loss. My condolences to you and your family. It brings me comfort to know that your husband and children surround you with love and support during this difficult time. Love and hugs to you. I’m so very sorry, Shanna, to learn of your Mother’s passing. She was far too young to be taken from you and this post is such a loving tribute. My sincere condolences to you and your family. I’ve found that cooking is great for catharsis and there’s something to be said for tempering sadness with sweet homemade treats. 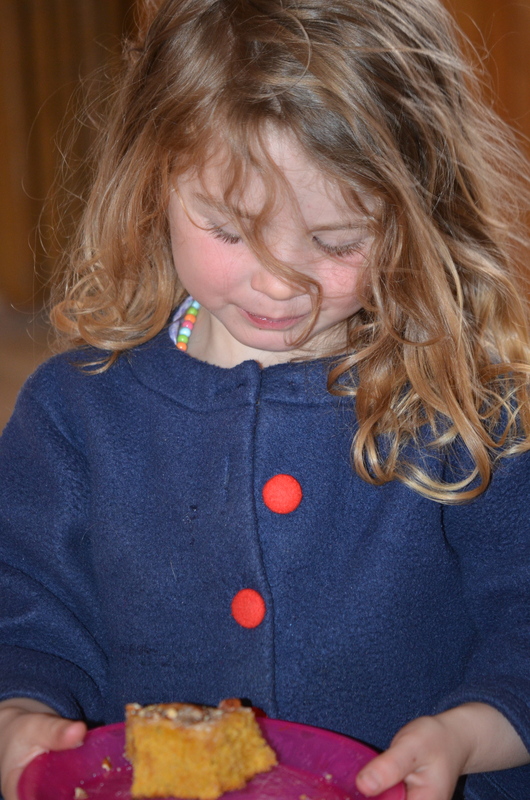 A beautiful post and beautiful pictures (also your children are just too cute!). I know I haven’t posted on here before, but extraordinary events can lead me to step out of the shadows. Many of you, particularly the regulars, as I think of you, may not know how helpful it has been for Shanna to be able to share her passion for making wonderful food for our family. With my hours, I do not get to support her in the way that she supports my career…so each comment you make serves as an affirmation of her talent as a writer that goes back two decades. And I can attest first-hand to her talent as a creator of delicious dishes and desserts! She deserves much more than I am able to give, and at a time like this, every bit of help and support from each of you means even more. I knew Shanna’s mother even less than she did, but I am grateful to her for having had the good fortune to give birth to my wife. Perhaps it doesn’t seem possible that someone could be as generous, patient, and loving as Shanna. As her lucky, lucky husband, I assure you: she is amazing. In the midst of her loss, she spent time baking for friends she wished to thank for recent kindness. That’s simply who she is. She raises our children with a tenderness that warms my heart each time I am fortunate enough to be around to watch them in her loving care. She sacrifices time to help friends, whether after a recent surgery or to celebrate a small triumph in life. Shanna is the kindest, most giving person I have ever met, and I am grateful for each kind word–and not just the condolences–you each have written in the past. Thank you from my entire family, and please help me give Shanna as much love and support as you can spare. Oh, Shanna! I am deeply sorry for your loss. I can sense the sadness in your words. My heart goes out to you and your family. I feel like jumping on the plane to see you, so I could give you a hug. I am glad that you are surrounded with a loving and caring family to get you through this difficult times. Oh no! I’m so sorry to hear about your mom Shanna! The sweet potato streusel buns sound very comforting, and a good food equivalent of a hug (which I hope you are getting plenty of). Thinking of you and your family during this difficult time. 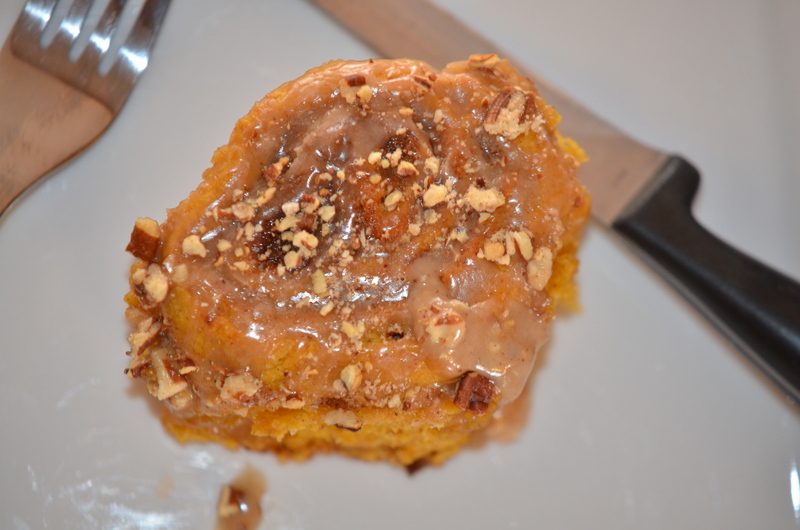 The sweet potato steusel buns look delicious! My thoughts are with you and your family, I’m very sorry for your loss. I’m really sorry hearing about your loss. You wrote a such beautiful and sweet post Shanna. I’m sure that your lovely family will bring you all the confort you need know. Baking can be a good way to exorcise the sorrow. Sorry for your loss and sadness. Good that you get comfort from the most important things in your life. Take care. Dear Shanna -Thinking of you and your family during this very sad time, John and I send you warm greetings from Maui. Thank you for sharing with us Shanna! Your words and insight brings comfort to your readers too. You express yourself beautifully and the sticky buns are a perfect metaphor for a time like this, especially the way your interpreted it. Sorry for your loss. I lost my grandmother to the same cancer, and then my mom to a different type of cancer. I didn’t know my grandmother too well, but, it was a very sad time for me. I was extremely close to my mom and even though it was 10 years ago it is still excruciatingly sad for me. You are right, our own family brings us such beautiful unconditional, constant love. Much needed. And I love how you took the bun right out of the middle of the baking tin! Classic. Dear Shanna, sorry to hear that your mother has passed away 😦 Our prayers and thoughts are with you and your lovely family. We are glad you are surrounded by your beautiful children and husband in this difficult time. Sending a big hug from all the way Europe 🙂 Btw lovely pictures, your children are so adorable. This Streusel buns looks incredible tasty!!! No doubt we are going to try this recipe. Thanks for sharing! Hello dear, so sorry to hear of your loss…it’s not easy to admit that you didn’t know her well .. when I read this, I felt something in common … me too, i can say. however, I think that admitting this doesn’t change your feeling of loss…I agree that be surrounded by love it’s a great strenght to come over so many obstacles. So sorry for your loss, Shanna. Having family around is certainly important, and it’s great how you have your family to support you. So sorry about your mom. I’m sure she would have been proud of the lovely young woman you have become! Sorry about your mom; losing a parent is tough. My dad passed away a few years ago, and I miss him terribly. I have many fond memories that I think of often. These rolls look great. I love my rolls with butter too; the saltiness of the butter marries with the roll’s sweetness making a lovely taste sensation in your mouth. One of the heathier recipes I’ve seen in a long time; must try.